We regularly post free resources to help you write. 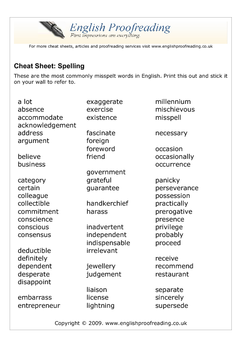 Here is a cheat sheet to provide you with a convenient list of the most commonly misspelt words in English. Print out the attached pdf and stick it on your wall for quick reference. With this cheat sheet your work will become an absorbing read! 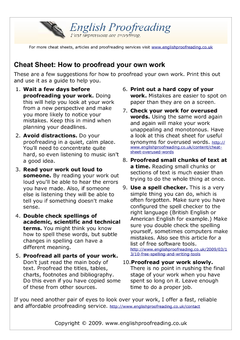 Here are 10 easy ways to proofread your own work. Wait a few days before proofreading your work. Read your work out loud to someone. Double check spellings of academic, scientific and technical terms. Proofread all parts of your work. Print out a hard copy of your work. Check your work for overused words. Proofread small chunks of text at a time.